An Item Bank, Answer Key Only (AKO) Assessment and an Express Assessment may be set up with the Teacher as the Intended User of the assessment instead of the Student. In this case, the teacher can enter the students’ answers on an online answer sheet after administering the assessment on paper. This technique can also be used for assessments administered at an earlier date, but data needs to be tracked. Find the desired assessment from the list in the Assessment Manager. Select the bolded Score Online icon (computer) . Or, from the SchoolCity Launchpad, select the ONLINE Flip Card. On the reverse side, select Enter Answers in Student Answer Sheet. Find the assessment you wish to score or click on More to go to the Assessment Manager. Assessment Name, Subject, and School Year. Search for the correct roster of students by Period. Click Refresh to view results. View By Students or By Groups (if any have been created in the Group Manager, and have been scheduled to take the assessment). Total Number of Students on the selected roster. Selected Student’s Name. Click on the down arrow to view the entire roster and select any student. Point value for each item. Set a Flag for an item. Click on Prev to go to the previous student on the roster. Click on Next to go to the next student on the roster. Click on the answers the student indicated on their paper test. The selected answer shows as green. 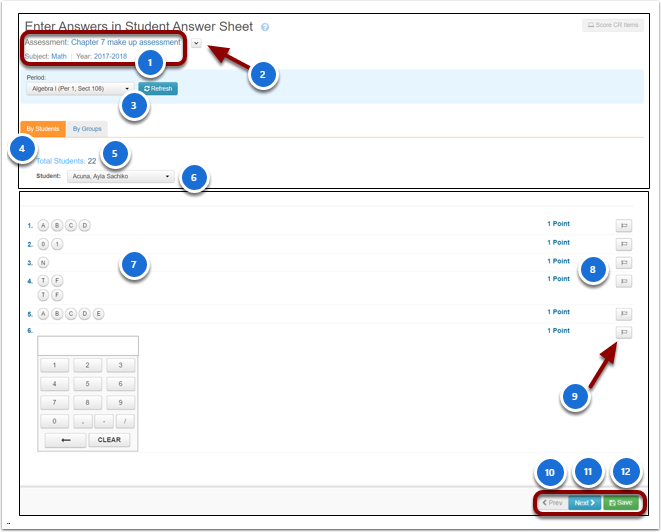 In the example, answers to 6 different item types are shown, although the assessment you have given may include other item types. Item #1: Multiple Choice (MC) - one correct answer out of a number of answer choices. Item #2: Constructed Response (CR) - student response is scored with a 1-point rubric and only the score is entered. Item #3: Short Answer (SA) - only one correct written response. Only mark the ‘N’ circle if the answer is Not Correct. Item #4: Multiple Binary (MB) each answer choice is True/False, Yes/No, or Correct/Incorrect. Partial credit cannot be given. Item #5: Multiple Response (MR) similar to Multiple Choice, but more than one answer is correct. Partial credit cannot be given. Item#6: Numerical Response (NR) use the key pad to enter the numerical answer. Click on the arrow next to the assessment name. It will change to orange and drop down menus in a green box will appear. Select the correct Year, Subject, and Assessment.